An auction of Native American artifacts scheduled for Friday in Paris is stirring up controversy on both sides of the Atlantic. Members of the Hopi tribe, native to northeastern Arizona, say that the 70 headdresses and visages (sometimes called masks) have cultural and spiritual value, and were illegally obtained. Auctioneers say the artifacts were legally purchased by a collector. The Hopi are demanding a return of the artifacts, which are valued at about $1 million. 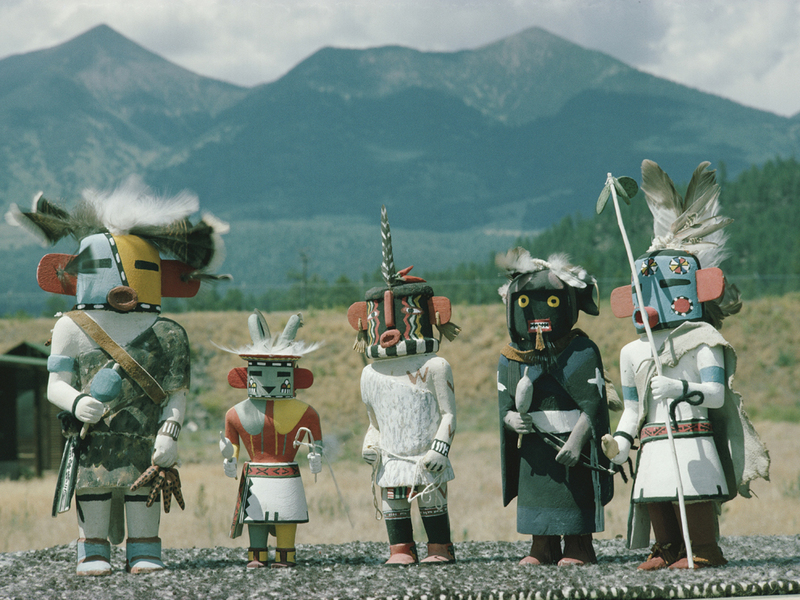 Kachinas, known by the Hopi as katisam, are sacred objects associated with ancestral spirits. There is a billion-dollar black market, or illegal trading network, for Native American artifacts such as those contested by the Hopi tribe. Cultural repatriation, sometimes called art repatriation, is a controversial practice that aims to slow this black market. Cultural repatriation is the return of stolen cultural objects to their original countries or communities. In addition to black market for Native American art, one of the most lucrative illegal art markets surrounds ancient Egyptian artifacts. Watch this video, “Stolen Sarcophagus,” in which a 3,000-year-old sarcophagus is repatriated through the efforts of American and Egyptian agencies. Can students think of other countries or communities that may have lost cultural artifacts to the black market in recent years, and may be working for cultural repatriation? National Geographic Executive Vice President Terry Garcia names one in the video (starting about 3:12): Peru, where gold Inca artifacts are looted. Jewish collectors victimized during the Holocaust lost valuable paintings and other works of art. Today, organizations are pressuring private collectors and public museums to return these artworks to surviving family members. Wars in Afghanistan and Iraq have contributed to trafficking in art from those countries, such as clay tablets. Economic growth in China and India has increased demand for artifacts from those nations, such as pottery or manuscripts. Money. The antiquities market is a billion-dollar business. Museums such as the British Museum (in London, England), the Louvre (in Paris, France) or the Metropolitan Museum of Art (in New York City) employ thousands of people and bring in millions in tourist revenues by displaying ancient artifacts. The cities, communities, and countries where these artifacts were created would benefit economically from repatriation. Heritage and Context. The artifacts are part of the cultural heritage of these countries or communities, and are best appreciated within their cultural context. Ownership. The Hopi are unlikely to display culturally repatriated objects, as such a display would violate cultural and spiritual traditions. Supporters of cultural repatriation say that how a community displays, chooses not to display, or sells its artifacts is entirely up to that community and its sense of heritage. These artifacts are not a shared cultural resource, supporters say, but resources owned by a community. Colonialism and Independence. The majority of objects targeted for cultural repatriation are legacies of Western colonialism. Removing important cultural artifacts was a sign of political and economic control. Supporters of cultural repatriation say that as formerly colonized communities gained independence, former colonizers should recognize this independence and return cultural antiquities. Money. Museums such as the British Museum, the Louvre, and the Met employ thousands of people and are responsible for millions of dollars in tourist revenues every year. The cities, communities, and host countries benefit economically from the display of such valuable treasures. Safety. Museums are often in highly developed nations, where preservation technologies are usually superior to those developing nations where artifacts originated. Critics of cultural repatriation say that artifacts are more likely to deteriorate where high-tech preservation techniques are not available. Exposure and Exchange. Museums such as the British Museum, the Louvre, and the Met are in big cities, where the artwork may be seen and enjoyed by millions of people: teachers, students, historians, and the general public. Critics of cultural repatriation say that if the art is removed, fewer people will know and appreciate the culture from which it came. History. Many pieces of contested art, such as the Elgins, were legally obtained at the time. Critics of cultural repatriation often support enforcing current laws that limit the sale of antiquities, but resist applying current laws to historic purchases. Heritage. Critics of cultural repatriation question the relevance of ancient artifacts to today’s cultures. Modern nations may not have strong connections to cultures that existed hundreds or even thousands of years ago, they say—these cultures may be separated by language, society, fashion, religion, etc. National Geographic Archaeology Fellow Fred Hiebert has taken a leading role in educating people about cultural repatriation and preservation. Why would the U.S. military ask Hiebert to help train American soldiers in cultural preservation? American soldiers are stationed at bases all over the world, and involved in military campaigns in Iraq and Afghanistan. Training in cultural heritage may teach soldiers to recognize stolen goods, or signs of an area being looted by “grave robbers.” Grave robbers, who illegally excavate ancient tombs or other sites in search of valuable artifacts, disturb the context of the artifacts, and put them at risk. National Geographic Emerging Explorer Albert Lin uses ground-penetrating radar to search for the tomb of Genghis Khan in the so-called “Forbidden Zone” of Mongolia. Read our profile of Lin. How do students think this sort of high-tech archaeology relates to cultural repatriation? If Lin or other engineers find any artifacts, they will not need to remove them for study or display. The cultural artifacts could remain in the community—even in the ground—where they were discovered. Can students think of any drawbacks to this sort of archaeology? Many audiences (including experts and the general public) prefer to have the actual artifact to view and study. Robert Ballard, the National Geographic Explorer-in-Residence who discovered the Titanic, opposes removing artifacts from the famous wreck. Watch our video “Save the Titanic.” Ballard calls the Titanic a “deep-sea museum” and even a graveyard. Do students think this makes people who salvage artifacts from the Titanic grave-robbers? Or do they think, in the words of a tourist, “they’re bringing back history so other people can see it”? With a better understanding of cultural repatriation, do students think the auction of Hopi artifacts should proceed? Should it be modified? Should all or some of the artifacts be returned to the Hopi tribe? Thanks for the blog today. The questions are excellent and will challenge the students to debate both sides. I think I can predict exactly which students will choose to return the artifacts, and which will not! I really appreciate the connections you provide.